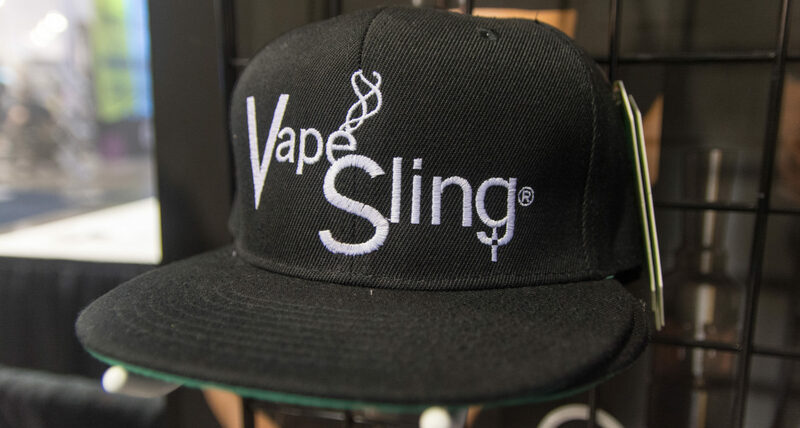 Visiting from @Vapesling IG or Twitter? Thank you for your support and visiting the VapeSling.com website. Posted 3/13/19 VTA on the Vapor State of your local state. See how your state is being affected. Posted 1/27/19 You Don’t Know Nicotine – Documentary Film: With all the media hype surrounding nicotine, it’s time to end the harmful misinformation and educate the public on what nicotine is, isn’t, and what should be done with it. Posted 8/18/18Link to download sign—> “Quit with Flavor”. Thank you to @jenbergercoleman of IG for the Campaign start. 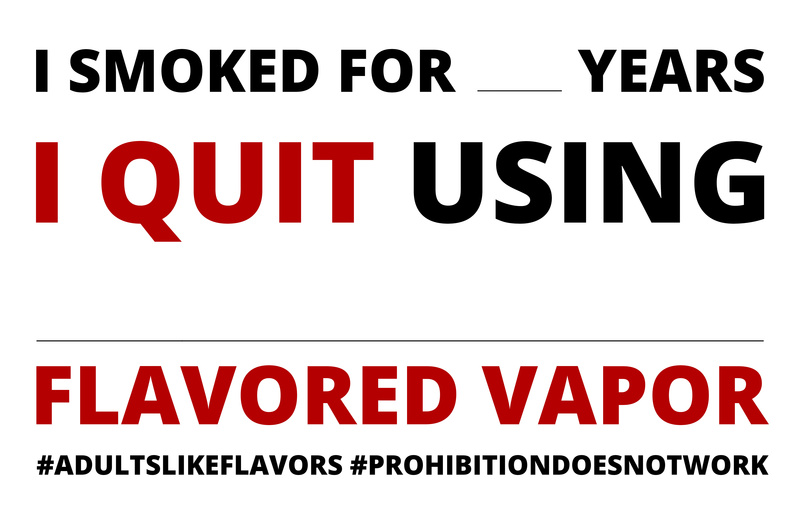 NotBlowingSmoke.org has provided a link to download the “Quit on Flavor” sign to be used for this social media campaign. Contact @jenbergercoleman on IG with your posting. Please join us and do your part and raise awareness of vape flavors important role. The posts will be shared with the Senate, Congress, President and FDA. Posted 6.21.18 CASAA and VTA announced a new campaign today. Submit your Sworn Declaration to the FDA today. Posted 5.18.18 Free VTA webinar using J.G. registered entry. View how irresponsible marketing is affecting Vapor Perception at it’s worst. FDA Standards for Vapor explained and detailed. Posted 5.04.18 Free SFATA Webinar “The FDA is Coming” Is your Business ready for FDA inspection? Posted 5.01.18 May 1st is Last Day for Flavor Survey. Take Action now, PLEASE! Posted 4.24.18 Alaska Lawmakers Reject FDA Deeming Vape as Tobacco. A huge 1st step. Posted 3.21.18 Extremely Important CTA–>Flavor Ban: Submit a Comment to the Federal Register on E-liquid Flavors. Posted 9/7/17 Wake up and smell the Vape Austrailia! Woman chained to bed to quit smoking. Posted 3/15/17 NEW FDA Head appointed by Trump Administration. Is he in favor vapor as Harm reduction? 1/27/17Who will be the next Head of FDA? Are they good for Vaping? Thank your Lawmakers for co-sponsoring HR1136 – They hear much complaints, rarely thank you’s…take this opportunity to do so…the Vape battle needs recognition. Map of ABillionLives Theatre premieres throughout the U.S. Send Sen. Ron Johnson a Thank You Letter, prepared by CASAA. All American and planetary vapers can send the letter. Wisconsin has the convenient electronic method. As a vaper, you know your duty. Send yours now. Help #VinylAndVapor help the Vape Community! Sign the petition, email, and complete the survey, please. Donate your Vape! The U.S. Army needs you for better health and stealth! Please help “WhoAreTheVapers” film to get their Pro camera. Please donate whatever you can. Who Are The Vapers Film? If you Vape, you may be in this film. Click here to findout more. Click here and Sign the Petition! Change.org Petition started by @dave.seeker.of.clouds Sign to “Urge Gov Jerry Brown to not let is go down”. California and everyone else, Veto SBX2-5= Tobacco 21, taxes, and banned sales of vapor products online. 65% of online Vapor sales come from California. Sign today! Sign the Petition to correct FaceBook’s stance on Vaping. Mark Zuckerberg has made a human error. He has mistakenly called Vape products, tobacco products. Vapor products contain Zero tobacco. Sure, there is nicotine, however, no terminal TAR to kill you. Vaping Nicotine e-liquids doesn’t kill, Smoking tobacco TAR does. Right-smoke-free-coalition Click here to learn of a great Fighting Advocate Group made from your our favorite Vape Manufacturers and retailers. They fight for your right to vape. Nevada Senator Harry Reid email response. Vaping and children mentioned. Click here for the entire email response. Advocacy-opposition-and-the-vaping-truth: Misleading and incorrect vape info. A deadly trend. Your-vapers-army-captain. Read her story on how she became one of the Billion lives saved by vaping. We have till 12/30/15 to BLAST the FDA. The Agency is taking this action in response to a request for an extension to allow interested persons additional time to submit comments. (1) Call the White House! Urge President Obama to demand that the FDA re-work their deeming regulations to allow most vapor products to remain on the market. We have provided talking points HERE. (2) Send a Message! While you’re waiting to be connected to the White House (or after you’ve completed your call), please send a message to your US Representative and Senators urging them to support and co-sponosor HR 2058. Vapers Army: WE made Vape History!!! Takes 1 minute and will help save our vaping community! VapeSling LLC will have their employees on the phone with congress and senators after we reach 100K to qualify. At this time we are at 62k. only 38k to go. The Family Smoking Prevention and Tobacco Control Act (Tobacco Control Act) became law on June 22, 2009. It gives the Food and Drug Administration (FDA) the authority to regulate the manufacture, distribution, and marketing of tobacco products to protect public health. The Family Smoking and Tobacco Control Act allows the FDA to issue regulations asserting jurisdiction over other tobacco products, such as cigars, cigarillos, e-cigarettes, and hookahs, among others. FDA expects to issue deeming regulation in the Spring of 2013 to cover other tobacco products. See CASAA’s The FDA & Deeming Regulations of E-cigarettes for more detailed information. See CASAA FDA Actions and Previous FDA Actions by CASAA for more detailed information about what CASAA has been doing and to see the FDA Calls to Action.